Imagine you have been charged with a serious felony: assaulting a police officer. You insist you never laid hands on the officer, but the officer insists you physically assaulted him and resisted arrest. Fortunately, the officer was wearing a body camera at the time of your arrest, which would provide the most objective evidence of what actually occurred. But what if the officer failed to preserve that video? What if he deleted it, or allowed the recording system to override it, before you or your attorney ever had a chance to review it? Great, you say, my case will be dismissed! Not so fast. Under current Supreme Court case law on government destruction of evidence, the burden on the accused to get any relief is often insurmountably high. Is it Possible to Obtain a Dismissal? The obvious problem with these rules is this: how can the accused prove the exculpatory value of evidence he was denied access to in the first place? How does one know what the footage would have shown when all that is left is the word of the accused versus the word of the officer? And how does one prove the bad faith of the destroyer of the evidence without having first seen the evidence to ascertain the motivation to destroy it? This is particularly problematic given that Virginia law does not allow defense attorneys to issue subpoenas to police officers, making it even more difficult to obtain recordings before they are accidentally (or intentionally) overwritten or destroyed. To further compound this problem, Virginia courts do not allow what is known as a “spoliation of evidence” instruction in criminal cases. In civil cases, if a party intentionally or negligently destroys relevant evidence in its possession, the opposing party may be granted a jury instruction allowing the jury to infer that the destroyed evidence would have been favorable to the opponent, thereby discouraging destruction of relevant evidence in civil litigation. But in criminal cases, there is no spoliation rule under Virginia law. 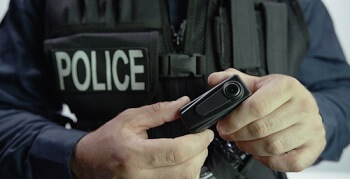 That means not only will your case likely not be dismissed, but the jury will not be instructed that it may infer that the body cam footage would have been unfavorable to the prosecution. Of course if the defendant were to destroy evidence relevant to the offense charged, he would almost certainly be charged with obstruction of evidence. Perhaps the impact of the problems outlined above is minimal in reality, because most prosecutors and law enforcement officers are ethical and would never intentionally destroy relevant evidence. But rules of evidence preservation, just like rules governing the lawful means of obtaining evidence in the first place, must consider the incentives they create and the behavior those incentives produce. Consider the Supreme Court’s formulation of the “exclusionary rule” in the context of search and seizure law. That rule provides that evidence obtained by violation of the Fourth Amendment must be excluded at trial (subject to limited exceptions). The rationale of that rule is clear: law enforcement officers must not be incentivized to illegally obtain evidence in their zealous pursuit of convictions. Likewise, law enforcement officers must be discouraged from destroying or failing to preserve evidence that may exonerate a person accused of a serious crime. It is well-established that the accused is presumed innocent until and unless proven guilty; that guilt must be proven beyond all reasonable doubt; that the prosecution bears the burden of proof; and that the accused has absolutely no duty to present any evidence in his defense. These rules seek to protect the most fundamental of constitutional rights—the right to due process of law and to a fair and impartial trial. But for these rights to have any real bite, the law must more effectively protect the accused against the loss or destruction of evidence in the government’s possession that may be favorable to his defense. At a minimum, an inference that the destroyed evidence would have been favorable to the accused is necessary in order to incentivize government officials to properly preserve all relevant evidence in their possession. If you have been charged with a crime and need help presenting your defense to the judge or jury, in light of exculpatory or other evidence, call the Fairfax criminal defense attorneys at Greenspun Shapiro PC today to discuss your case.